I have to say, Stampin Up hit it out of the park with the September’s Paper Pumpkin kit. In case you missed it, September’s kit came in this adorable black box with spider webs printed all over it. If you collect the boxes, this is one you don’t want to miss. The kit itself contained enough supplies to make 24 treat holders. This is perfect for those that want to give out some special treats to your friends or your kids friends. As usual, the kit is super quick to stamp and assemble. I made one of each of the three treat bags in about fifteen minutes and that included the time it took to unload everything from the box and figure out which pieces went with each other. And now you’re thinking, that these would be perfect for your kid to pass out to their classmates and friends, but 24 isn’t quite enough to do that. Don’t worry, you can get the September refill Kit online and it includes everything to make another 24 treats except the stamps and ink pad. If the kits sell out on the website, please contact me as I have a couple extra Full Kits and Refills in my stash. Stop! I know you’re all excited about Paper Pumpkin now, specially after seeing September’s adorable kit. But don’t subscribe to Paper Pumpkin this weekend. You need to wait until Monday to subscribe. Paper Pumpkin has a LIMITED NUMBER of October kits to offer at this special introductory rate. 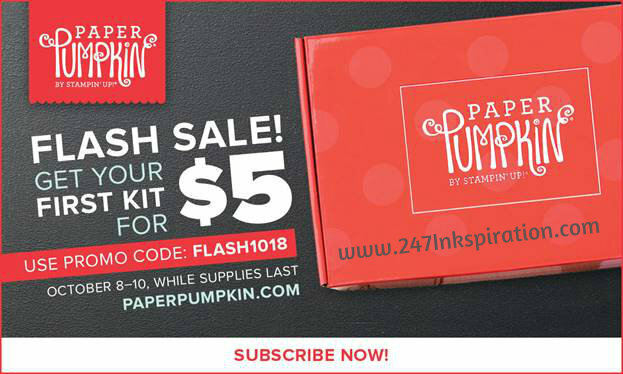 This Flash sale is for new subscribers to Paper Pumpkin. (Stampin Up tracks subscribers by email addresses and not mailing addresses.) Sign up now to take advantage of getting your first kit for $5.00. Use code FLASH1018 before the sale ends to receive this special introductory price. You still have time to take advantage of the World Card Making Sale going on all week. But don’t wait too long since Sunday is the last day of the sale. 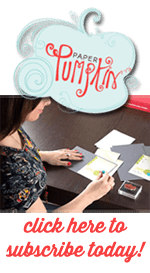 Stampin Up has a select group of stamp sets, card kits, and crafting supplies that are on sale this week only. You can bet I will be stocking up on adhesive this week. Check out the great deals listed here.